The WATTS ACV Solenoid Control Valve is designed to open fully or close drip-tight as commanded by a 3-Way Solenoid Pilot. The solenoid may be activated by a pressure switch, level probe, or any other electrical on-off device. The valve also has provisions for manual operation in the event of power outage. Engaging the Solenoid Manual operator simulates power to the solenoid, manually controlling the main valve. 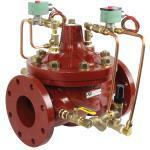 Disengaging the Solenoid Manual operator returns the valve to electrical on-off service.